Halloween is right around the corner. If you need something easy (and green too) to put your treats in, then these homemade goodie bags are for you. Inspired once again by Martha Stewart. Here is my version of her Boo Bat and Moon bags. Stamp half your bags with the word "Trick" and half with the word "Treat". 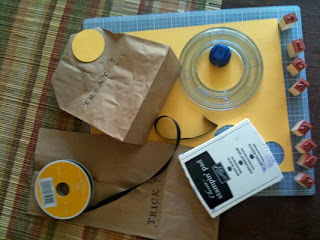 Cut out 1 yellow cardstock circle for each bag and attach with glue about half way down bag (where you will fold). Fill your bags with treats (you can make some bags tricks if you want to). Fold down the top half of your bag. Punch 4 holes in the yellow circle - 2 sets of 2 holes, close together. Take a length of black ribbon, thread the two ends up through one set of holes and tie a knot. Trim to bat wing length. Repeat with the other pair of holes. 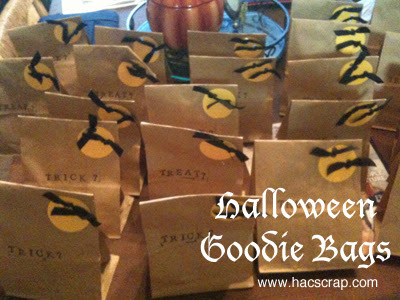 That's all there is to making your own environmentally friendly Halloween Goodie Bags. These bags are great for school parties or to give out on Halloween Night.